Friday July 18th 1890 We washed this morning and done some baking. I sewed all the afternoon. I got the pleating ready for my dress and a good start on Mothers old wrapper. Saturday July 19th 1890 We did not have much house work to do so we both put in the day sewing and got Mothers wrapper and my dress nearly done. Fanny and Annabel was here in the morning. Winnie went home to stay a week and pick berries. Sunday July 20th 1890 Will and I went to the west farm in the forenoon and found things in good shape there. The Woolf girls have company a Miss Shirts from Delavan. I slept awhile in the afternoon and wrote to Vene, Lizzie Duncan and May. weather cool and pleasant. 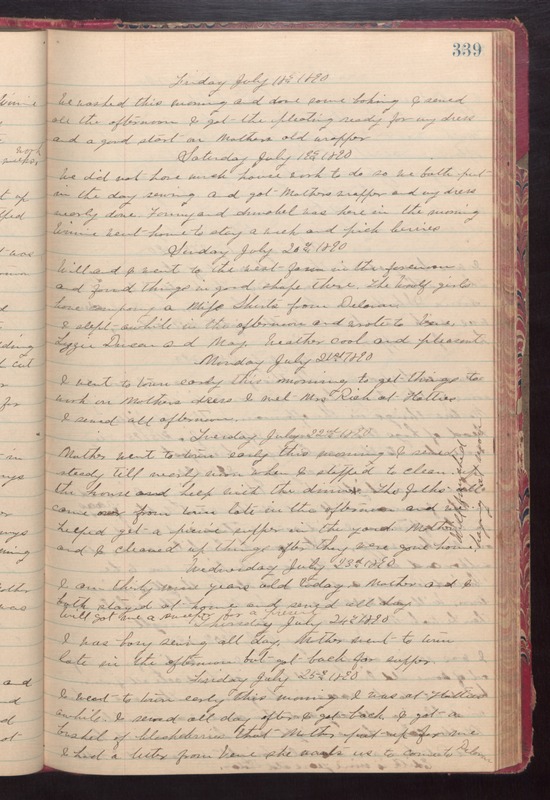 Monday July 21st 1890 I went to town early this morning to get things to work on Mothers dress. I met Mrs Rich at Hatties. I sewed all afternoon. Tuesday July 22nd 1890 Mother went to town early this morning. I sewed steady till noon when I stopped to clean up the house and help with the dinner. The folks all came over from town late in the afternoon and we helped get a picnic supper in the yard. Mother and I cleaned up things after they were gone home. [The following text is written vertically in the right margin of the above entry] Will finished haying at noon. Wednesday July 23rd 1890 I am thirty nine years old today. Mother and I both stayed at home and sewed all day. Will got me a sweeper for a present. Thursday July24th 1890 I was busy sewing all day. Mother went to town late in the afternoon but got back for supper. Friday July25th 1890 I went to town early this morning. I was at Hatties awhile. I sewed all day after I got back. I got a bushel of blackberries that Mother put up for me. I had a letter from Vene she wants us to come to Delavan.